It’s so satisfying to check stuff off my crafty list of things to do. 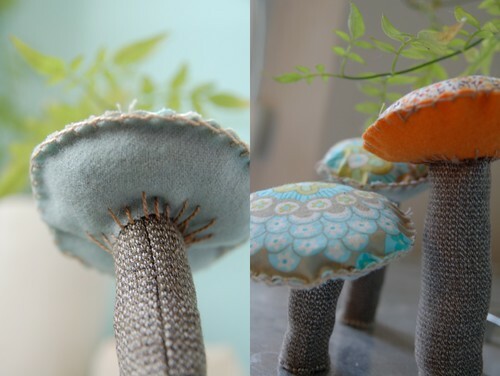 Making fabric mushrooms has been on that mental list for a very long time, so I was really inspired when I saw Mon Petit Lapin’s post that directed me to this tutorial. Thank you, Rebecca! I find projects that use up scraps of fabric especially gratifying. They make me feel much less guilty about the boxes of fabric bits that I’ve been hoarding for so long. You might notice that two of the mushrooms bear a striking resemblance to my new lounge pants. That fabric just seemed like perfect mushroom fabric and now I’m coordinating with my room decor. The orange mini floral is a scrap from a fabric I’ve used in many many projects. I was even more thrilled to finally find a great use for my jar of thread bits. I’ve been collecting thread at the shop, hoping to recycle it one day. It makes an ideal stuffing for these mushroom softies. This project is really easy, the hardest part was finding the right little stones to put in the base of the stem to hold them upright. Even still they are not very stable, but as a set, they seem to hold each other up. Next up, I’d like to tackle a few projects from the Softies book. I especially like these sweet bunnies. I hope that Perfect Bunny won’t mind a few friends. My ultimate goal is to make some birds, a giraffe and a squirrel. I’m incredibly inspired by these talented ladies – Ashley Anna Brown, Ann Wood, Rosa Pomar, and Tamar Mogendorff. Thank you for the link, I have been wanting make some mushrooms! I love the idea of the threads too! Just wanted to say that you store looks beautiful and so inspiring, I would have taken everyone one of the classes that you offer. I am so glad I came across your blog! Take care. hi katie! thanks so much, i am so lucky to be doing what i do. i just visited your blog and i am now determined to try out this disappearing nine patch trick! thanks for the inspiration. i love those miss k! looks great!!!! I love the idea of using thread bits as stuffing — I’ll start colecting thread bits today! michelle & rosalyn – thanks! margie – what an excellent tip! i think that would be so much better and i’ll do that for my next set. your mushrooms are extra cute, i love their faces! concha – the thread makes really good stuffing and there’s always lots of scraps of it lying around. it’s nice to re-use it somehow. Karyn, do you check out softies central? It’s always inspiring to look at the variety of softies people are making. Congratulations on getting time to make these – yours look great, lovely fabric choices! This is such a beautiful little post and now I have a way to use up my fabric scraps as well.